In honour of the Year of the Water Snake and the festival’s ninth year running, Symbiosis Gathering 2013 took us to the stunning isolation of Woodward Reservoir in Oakdale, CA to lose ourselves in an unbeatable line-up, and to then find ourselves in poetry, trees, healing domes, sacred fires and endless dives into the lake (for which we are all grateful). 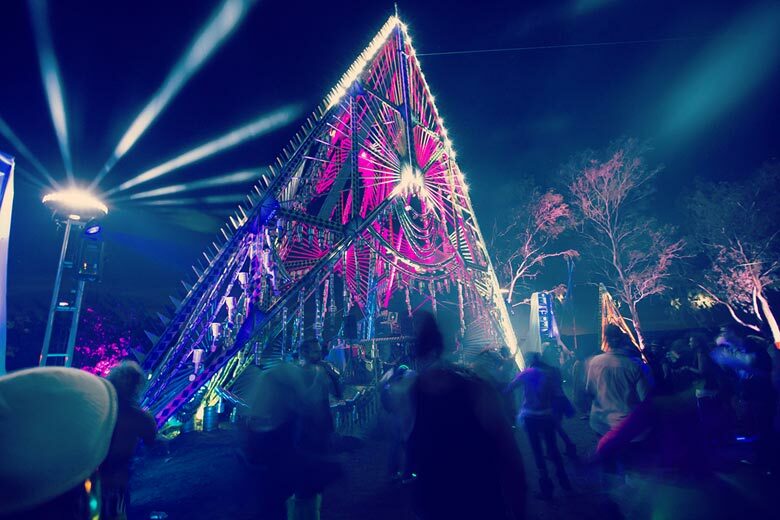 With an emphasis on the magic of transformation, Symbiosis provided an enchanted space of bio-psycho-spiritual healing, environmental and sociocultural conscious learning, and a unique source of musical inspiration. Among the many loved and soon-to-be loved artists was the powerful voice of Lynx, the free-flowing explorations of Mount Kimbie, and the ever-passionate words of The Coup. Out of the untamed medley of transcendental ritual and primal movement that coloured the ether emerged, like a wild cat to the stage, Lynx: a woman whose roar resonated with deep earthy sounds that, like any shamanic heartbeat, carried the audience into a trance. Lynx’s style marries folk, electronica, and traces of indie pop with her own beat-boxing, into a highly satisfying cross-genre hybrid, arousing overwhelming appreciation from a crowd immersed in continuous proclamations of love. With her first album, October 2010’s On The Horizon, this Bay Area-brewed artist has been charming the world with her strong vocals for some time, and yet my first taste of her at Symbiosis was certainly a highlight of the festival for me, as it no doubt was for many others. Lynx creates a raw, sensual atmosphere throughout songs that swing from downtempo to upbeat rhythms. Her lyrics evoke archetypal imagery of a profound feminine power. On The Horizon presents a magical copulation of the inner unconscious in a poetic dance with a surreal surface world, as Lynx sings of existential ruminations amid romantic sentiments in a lyrical journey that hints at a negotiation of the self. At a festival focused on the partnership between two states of being, Lynx reaches symbiotic perfection through both technical eclectic success and a smooth voice that seduces the audience into watery world balanced between the emotive and the physical, leaving the crowd soaked in enjoyment and hungry for more. Luckily for all of Lynx’s pre-existing fans and the new ones she created at Symbiosis (such as myself), her new album, Light Up Your Lantern, will be released on October 22nd. Ever minimal and impeccably fluid, Mount Kimbie’s live set was a sublime transition from the long and vibrant weekend into the final night of the festival. Following the immensely popular acts of Shpongle and Chet Faker was never going to be easy, but an eager audience packed out the stage and ascended the hills to watch the show from above. There was something ethereal about Mount Kimbie’s performance; their ambient synths invoked an aura of the otherworldly, a perfect compliment to the alluring lake-side setting and surreal neon dancers. And yet sophisticated design and evocative lyrics kept their music grounded, providing a depth of experience in an otherwise uncanny world. Perhaps this balance between the melodic and the minimal, with a slower tempo than dubstep, is exactly what one can hope to expect from the genre of post-dubstep. Still apparently ambiguous and debatable in the public consciousness, post-dubstep (however one chooses to identify this possible ‘not-genre’) finds room for growth in the work of Mount Kimbie, who continue to excite and propel the UK electronic scene. Their latest album, Cold Spring Fault Less Youth enriches minimalism with instrumentals of drums, horns and organs, demonstrating the band’s capacity for change throughout their career — an expansive approach to music that appears almost playful in its exploration of what’s possible. The result is a sound that is both captivating and at times eerie, with a supple quality that is not only pleasurable to the listener, but a testament to the malleability of Mount Kimbie’s sound and their potential in the future. Symbiosis excelled in presenting festival-goers with a tasty mix of relatively new sounds to delight the ears, and delicious as they are, The Coup are anything but new. Formed in 1991, this Communist hip-hop group are on their sixth album, and yet for many at Symbiosis, The Coup still needed introduction. On his Tumblr page, lead singer Raymond “Boots” Riley addresses the band’s lack of a “big break” with an honest reflection on how his lyrics targeting social inequality and anti-capitalism are received by distributors, or why radio stations continuously refuse to play their songs. But such a corporate dismissal in no way reflects on the excellence of The Coup, who burst onto the Symbiosis stage with an unrelenting energy that bounced between Riley’s awe-inspiring dance moves and exquisite vocals from the likes of Silk-E. After twenty-odd years, The Coup remain fresh, spirited, highly passionate and quite possibly empowered by Riley’s faith in the angel of revolution. Here post-funk aligns itself to an irresistible beat and edgy poetics that deconstruct social categories and enforced systems of control, above all with a determined hope in the power of solidarity. Among the many performers at Symbiosis, The Coup stood out and existed in just a handful of artists demonstrating an overt dedication to music as a force for social and political change. Perhaps Riley’s disappointment lay in his need to channel the audience into a deeper engagement with the music — first with a metaphorical “get off the wall and dance” and then by remarking that the only way to really transform the world is to engage with it. The Coup were bold, no holds barred, and a refreshing addition to a festival that seeks to empower transformation. The Coup delivered an unmissable, attention-demanding show with a funk so contagious that dancing was unavoidable. On a warm and slightly sleepy Friday afternoon The Coup were a wake-up call to be conscious and get active. As Symbiosis sought to unite sublime sounds and aspirations for a more conscious existence with Tibetan yoga, permaculture workshops, ancestral arts, healing circles, and talks on community organisation and sustainable living to name but a few, the festival opened the stage a wealth of emerging artists integrating electronic melodies with messages of higher living drawn from a fusion of Eastern and Western cultures. Among these was Rising Appalachia, two multi-instrumental sisters from the South whose liquid vocals met with the ambient electronics of The Human Experience to create the newly released Soul Visions: a smooth musical experience coaxing consideration for social injustice and causes for activism, a tone for which Rising Appalachia are so well-known. Building on the success of their acoustic traditional kirtan album Heart & Soul, the LA-based Kirtaniyas took the opportunity to showcase their electronic set, fusing EDM with live classical violin and Sanskrit mantra vocals, creating a sensational symbiosis of two musical worlds with an emphasis on freedom of the mind and transformation of the soul.